Digital electronics is an interdisciplinary subject of electronics, electrical, information technology, computer science engineering and sciences domain. Digital Electronics has been written as per the syllabus of Digital Electronics, Digital Circuits and Logic Design of various universities like PTU, GNDU, PU, SLIET, DU, PEC, NITs and Thapar University. 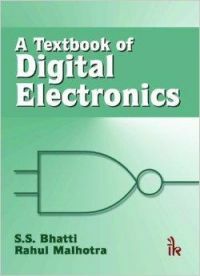 The book provides a comprehensive coverage of the funda-mental aspects of digital electronics. It not only explores the theoretical and practical aspects of digital circuitry, but also gives a glimpse of experience and classroom interaction of the authors. Besides, the step-by-step methods to solve the digital system problems, it also includes the shortcut methods to digital approach for job interviews and competitive examinations. This book is invaluable for BE, B.Tech., B.Sc., M.Sc. (Computer Science/IT), M.Sc. (Physics), M.Sc. (Electronics), BCA, MCA, PGDCA and PGDIT students.